We are constantly faced with choices every minute of our time on earth. Most of our choices don’t matter and are inconsequential. In May Mercy Lie (Director Aaron Courseault) the choice one man is forced to make has moral debt attached. It’s a choice between life and death; a choice between mercy and murder. 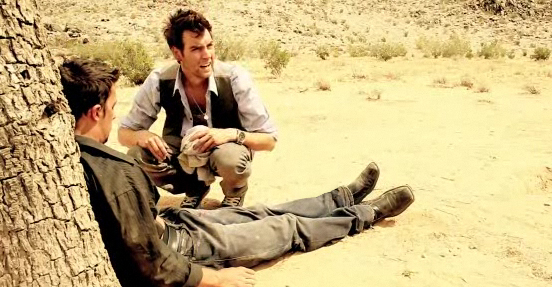 The film opens with two men lost in the desert. One of the men is near death and semi-conscious. The other man agonizingly carries his friend’s limp body. Every step is punished by the desert sun. The uninjured man’s intention is clear. He wants to carry his friend to safety. The heat and vastness of the desert render his intension powerless. Near exhaustion the choice is brutal; mercifully kill his injured friend and save himself, or die with him? “Only the Lord giveth; only the Lord taketh away,” his friend replies. Producer/Writer Stephen Seidel not only walks us into this moral cobweb, he plays the injured man with nerve tugging reality. His eyes are open one minute and closed the next; Seidel’s metaphor for seeing either light or darkness. Mathew Kevin Anderson, who plays the uninjured man, is also well rehearsed in the anguish, pain and frustration he skillfully gives to the role. Anderson plays the part so well that, right or wrong, you deeply care for him. The scenes (Michael Schultz/Editor) are meant to be redundant. Director Courseault, in fact, uses each repetitive scene as a ticking clock. Before long, the uninjured man becomes lost in a desert of hallucinations, which Courseault artfully uses to keep us guessing what is real and what is a dream? Given its limited budget, the film’s special effects are impressive. The remoteness of Joshua Tree, and a tragic but spiritually moving musical score also drive this film. May Mercy Lie is unmistakable in what it asks: Is mercy killing necessary and moral? Cleverly, Seidel doesn’t answer us, choosing to end his short film in two ways. The audience makes its own choice, one that Seidel, by film’s end, convinces us may not be simply circumstantial. Stephen Seidel is a writer/producer who clearly enjoys entertaining us. To his credit, he is a writer who likes to expose us to deeper questions in life, ones we don’t like asking, let alone living.